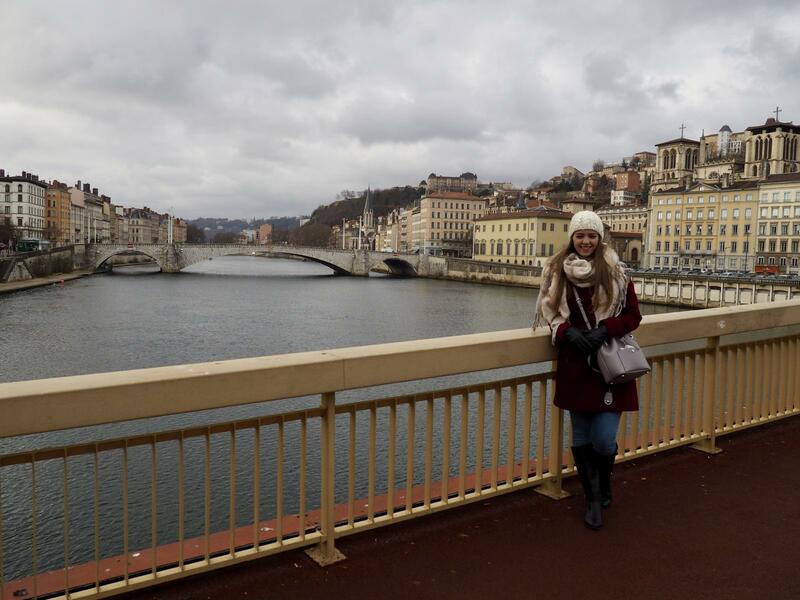 My first flight of the year was a 48 hour layover in Lyon, France. The last time I visited was in summer, so the weather was a bit different this time around! 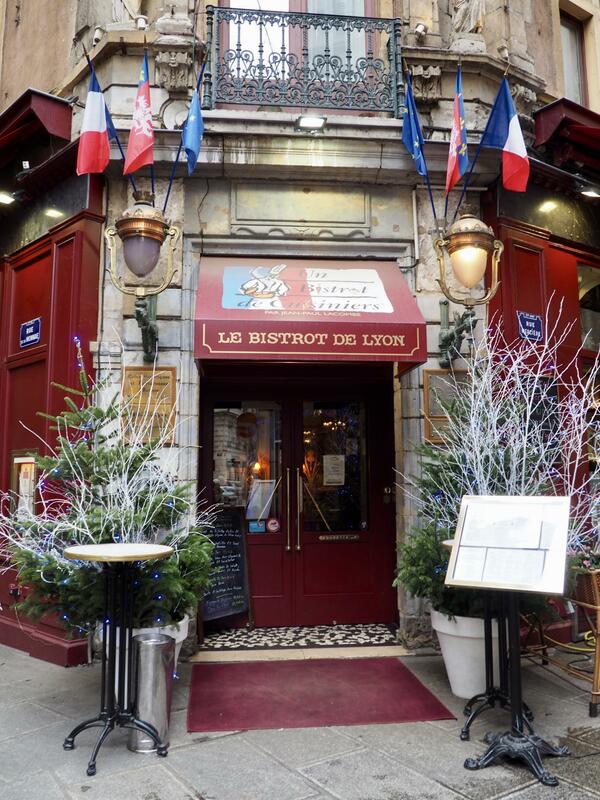 We arrived into Lyon in the evening, so on the first night there was just time for a light dinner and some drinks with the crew, while plans were discussed for the next day. Although I’ve visited before I was happy to head into the city and do some exploring. Nine of us managed to meet in the morning and jump on the bus, just a few stops into town to start our day out. We strolled through the streets, and although it was a quiet morning it was nice to enjoy the pretty architecture and atmosphere of the city. 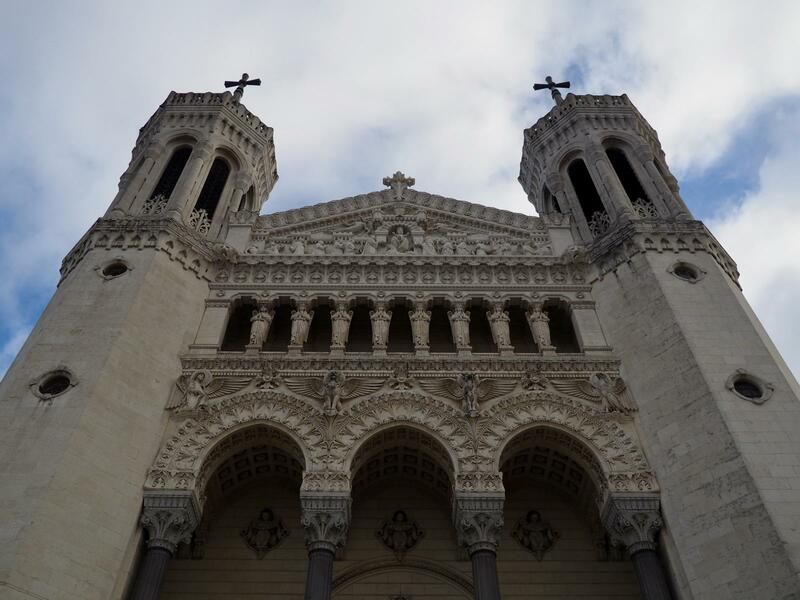 Our general direction was towards the Cathedral of Notre Dame de Fourvière, which is up on a hill. However nobody was in a hurry and all of us were stopping to take lots of pictures! 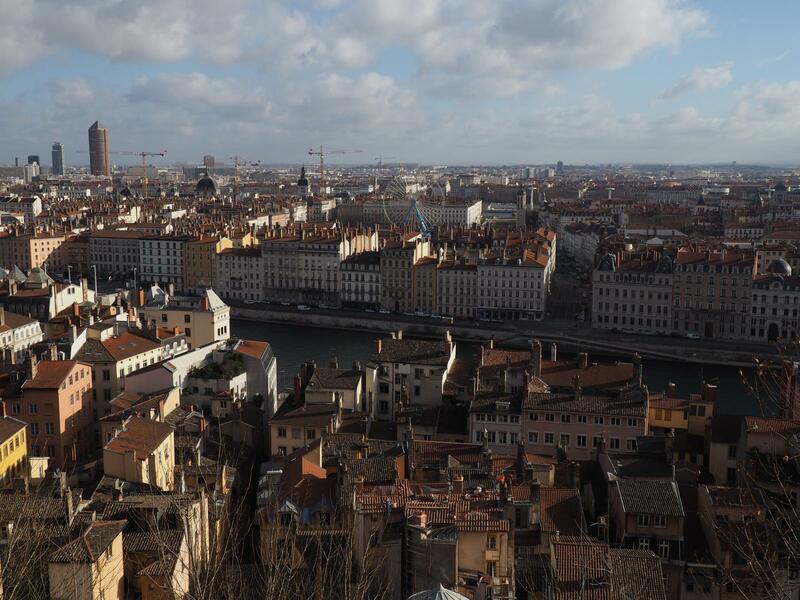 Lyon is actually France’s third largest city, after Paris and Marseille, and is located along the Rhône and Saône Rivers, which meet at the south of the city. 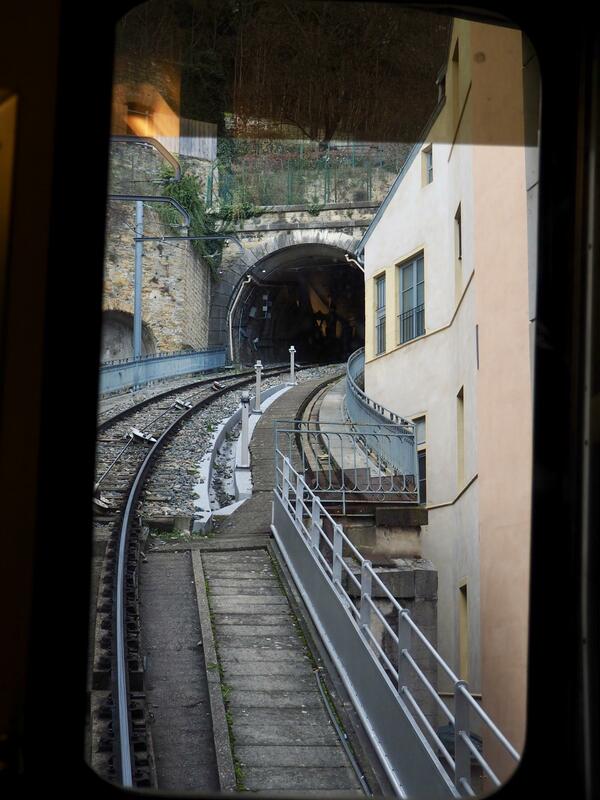 We had to cross the rivers to get to the Fourvière hill, and to reach the top you can either walk (which is what Kirsty and I did last time we were there) or take the funicular. The easy choice was obviously the funicular, and as we already had a ticket from the bus we didn’t need to pay any extra. In just a few minutes we were at the top of the hill, and as soon as you step outside you are greeted by the stunning cathedral. In the mean time the sky had even cleared up and instead of a gloomy cloudy day, it was now blue skies all around! Although I had been inside previously, that didn’t stop us from checking out the inside once more. 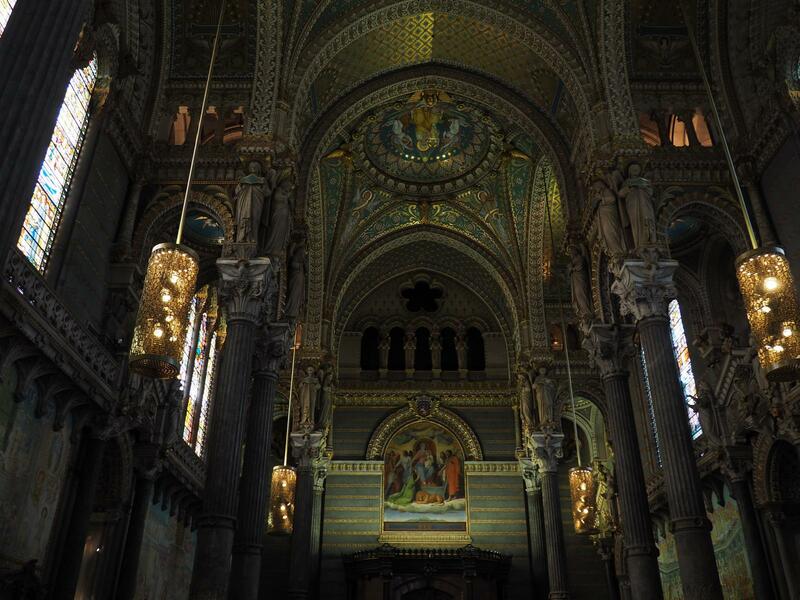 It’s absolutely beautiful, with incredible stained glass windows and lots of detail. I didn’t want to take too many pictures inside as there were a lot of people praying and it was very quiet and peaceful inside. 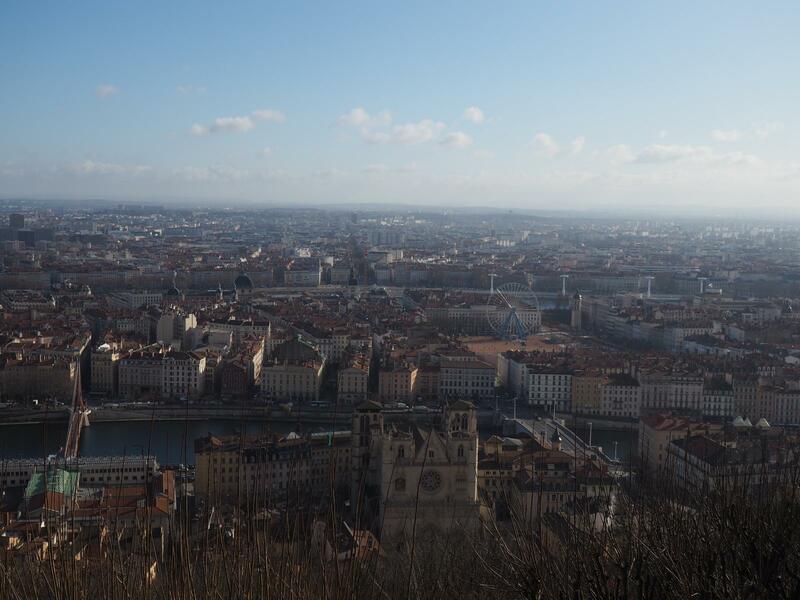 The view over the city of Lyon is what also makes a trip up to the top of the hill worth it. It’s a stunning panorama across the red rooftops, and we were lucky that the weather had cleared up so we could see for miles. In the distance you can see Place Bellecour, the largest pedestrian square in Europe, which is part of a UNESCO World Heratige site. 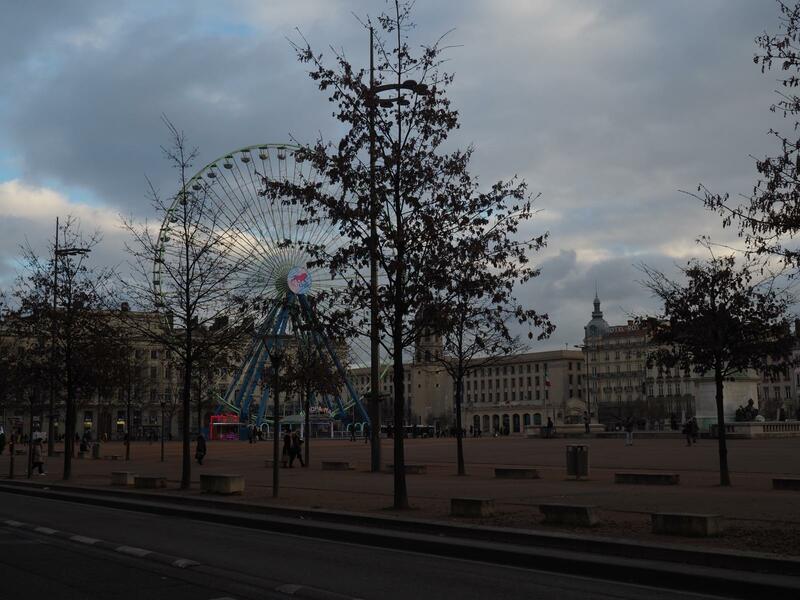 Along with the large ferris wheel which you can see from above, there is also a statue of Louis XIV, as well as a statue of Antoine de Saint-Exupéry, sitting in front of the Little Prince. 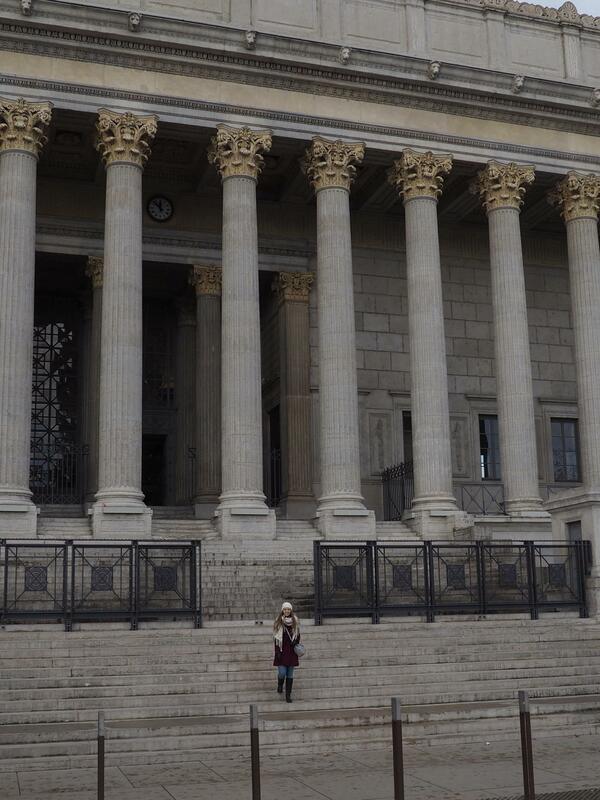 After making the most of all of the picture opportunities, we started the stroll back down into the city. 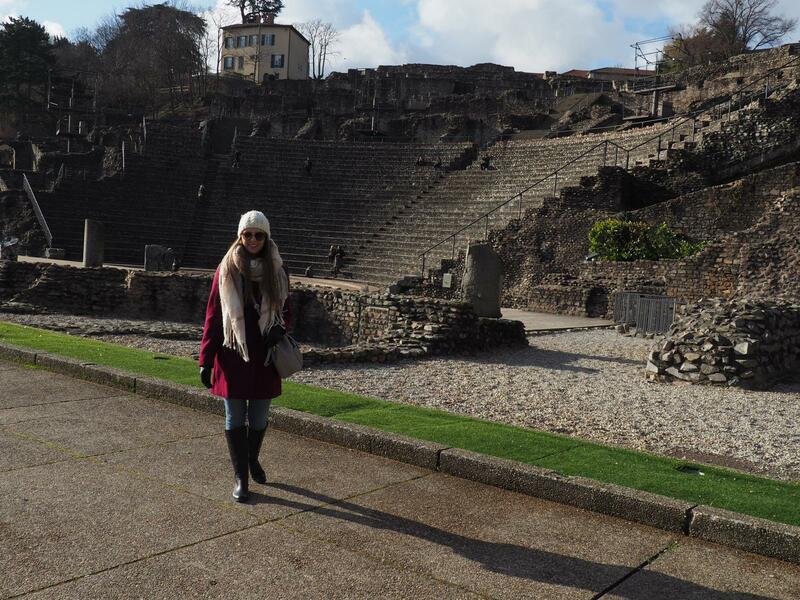 Not far from the Cathedral is the “Amphithéâtre des Trois Gaules”, a Roman amphitheatre built around 15 BC. Nowadays it is still used for occasional concerts and festivals, but unsurprisingly there was nothing going on while we were there, as it is all outdoors. Our walk down towards the city was lovely, and we stopped a couple more times for pictures along the way. 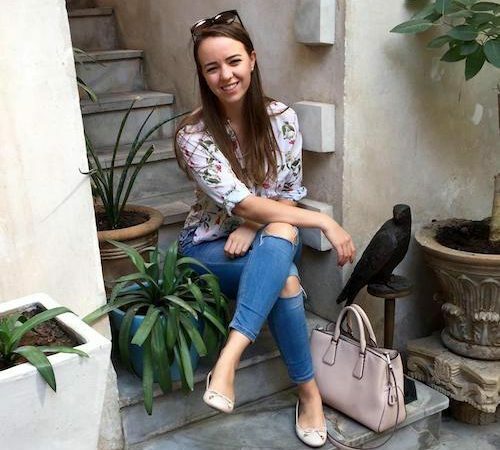 Before heading out I’d checked with the concierge for any restaurant recommendations, and he’d mentioned a typical “Bouchon Lyonnaise”, a type of restaurant local to the area, called Daniel et Denise. It happened to be just a few hundred meters from where we were, and luckily they had a table for 9 (most probably since we arrived slightly after the lunchtime rush). 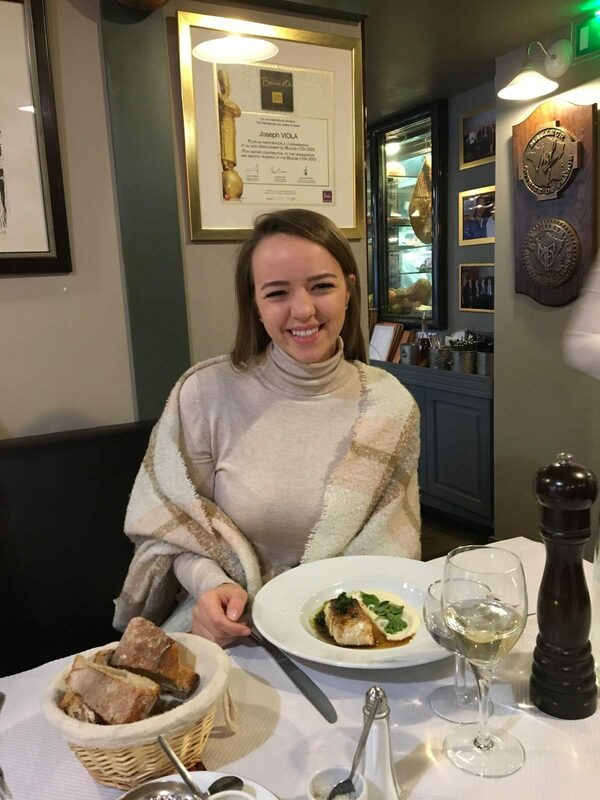 These type of restaurants usually offer a set 2- or 3-course menu for a reasonable price, so most of us went with the 2-course lunch for just under 20 Euros per person, if I remember correctly! After lunch, the 9 of us decided to split up and myself and a couple of the others made a move towards the shops. Soon enough the heavens opened and it started to rain, so we made our way back towards the bus stop to head back to the hotel. Our hotel is actually located right next door to a cinema so myself and one of the girls popped in to check if they had any films on in English. “Passengers” was showing a bit later so after a quick rest in my room we met up for a dinner of popcorn and a good film! 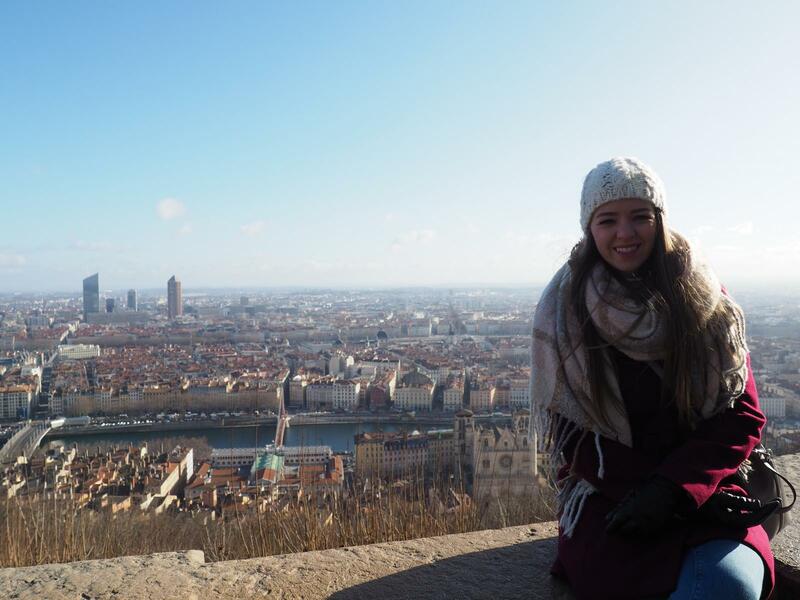 A great ending to a lovely day out exploring Lyon. I love reading about your travels. 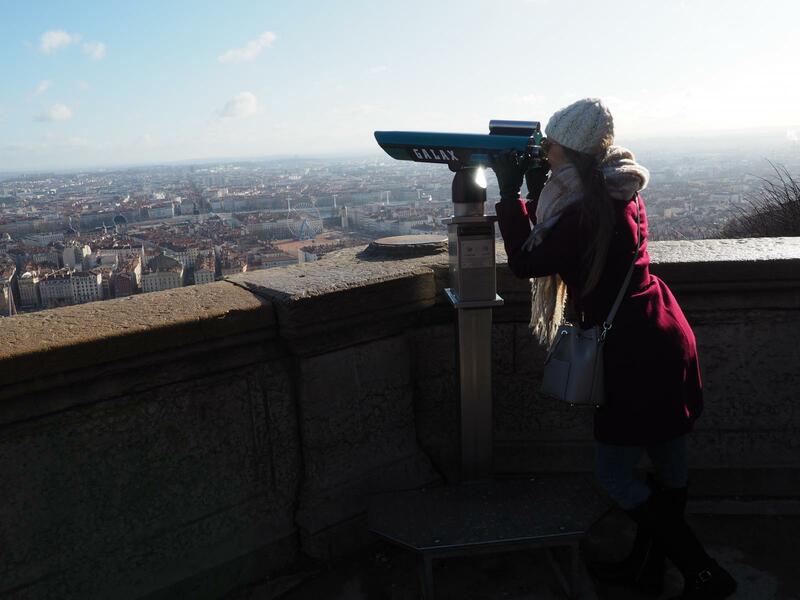 Lyon is actually my hometown so I especially love to see your pictures and “take” on my beautiful city. I think I know where your crew hotel is from your description of the cinema and wanted to recommend a great restaurant if you visit Lyon again. 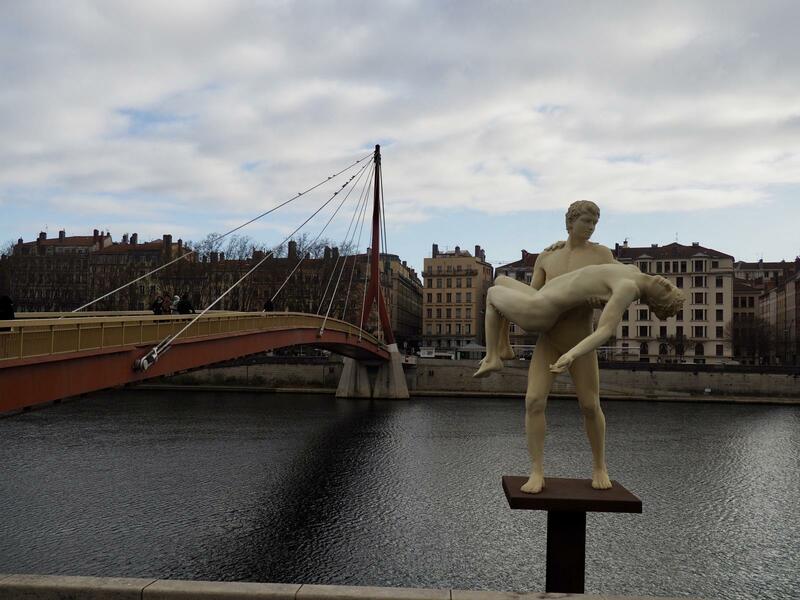 It’s an amazing Italian/pizza restaurant called Carlino’s and is across the river from your hotel near Hotel de Ville. 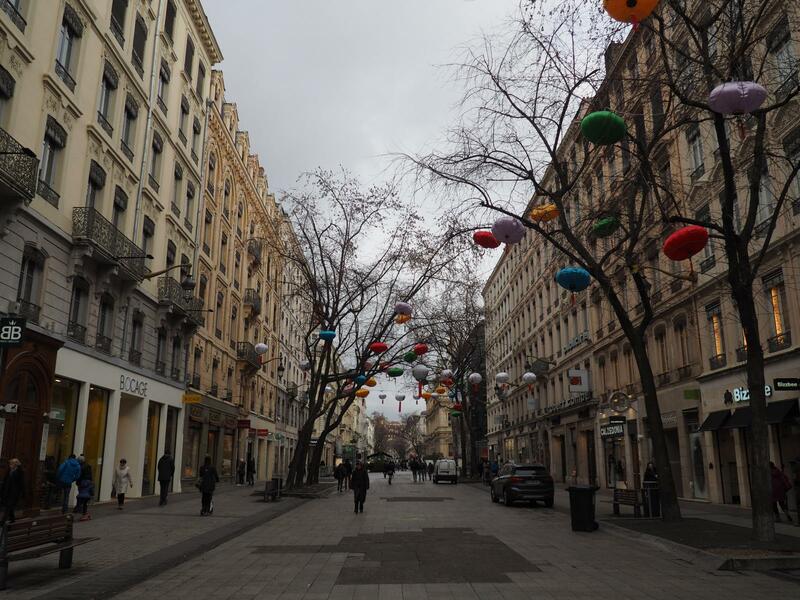 You visited Lyon a couple weeks before the soldes de hiver otherwise you could have had great shopping!